Please note: Over the last few years there has been an overwhelming demand for our Adirondack Series boats. In order to ensure that you receive your boat in time for the summer, PLEASE order in advance. Now’s the time to get out on the water in these great recreational boats! take a look at the Alden Whitehall 16! VERSATILITY: The Adirondack Series Wherry can be rowed as a single, a double, or a single with a passenger. In fact, the Adirondack Wherry can carry up to three adults; or two adults and two children. 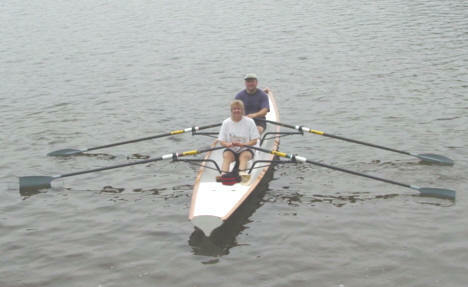 Change the sculling configuration in seconds! SEAWORTHY: Unlike racing shells, the Adirondack Series Wherry will row right through motorboat wakes, wind chop, and small surf. However, do not attempt sea conditions beyond your capability. STABILITY: The Adirondack Wherry has a 3 foot beam at the shear (approximately 2 feet at the water line) making it very stable in the water. It is an excellent training boat, fishing boat, family boat or cruising boat. FITNESS: If exercise is important to you, the Adirondack Series Wherry is your boat. It provides excellent cross-training for cyclists and joggers. In fact, you might abandon your other sport! The Adirondack Wherry allows total aerobic (low-impact) exercise in the peaceful environment of calm water. Wildlife won’t hear you until you are quite close, so carry a camera! PERFORMANCE: Although the Adirondack Wherry is too large to have racing shell performance, it is not slow. The Adirondack Wherry finished 3rd in the Heart of Texas Regatta (Recreational 20 ft and Under Division), 4th in the Head of the Chattahoochee Regatta (Recreational Short Boat Division), and 1st in the South Walton Sport Fest Three Mile Head Race (Recreational Double Division). Passenger Seat – take a look at this beautiful and comfortable passenger seat that screws right into the stern position of the wherry! Oars – Dreher carbon fiber, ultra light, adjustable handle macon or hatchet oars. Second Ro-Wing – the finest rowing geometry you will find in a drop in rowing unit. Do you have to trailer your Adirondack Wherry to the water? Check out the Trailex Trailers.